As you may have heard, AT&T officially launched its first salvo of live Long Term Evolution (LTE) services Sunday, in five cities: Chicago, Dallas, Austin, Houston and Atlanta. Above is the new updated map that is serving as Ma Bell’s announcement platform for its clear-as-mud 4G rollout; if you are following this story closely you know that in January AT&T decided to call its existing HSPA+ services “4G,” even though real faster speeds weren’t (and still aren’t) widely available across the entire AT&T service area. Never you mind! AT&T has a really big problem right now with its planned digestion of T-Mobile and — well, it probably can’t be bothered with marketing semantics. Or with nitpickers like us pointing out that even though AT&T launched its LTE services in the “summer” around here the third week of school is usually seen as “fall.” And hey Kris Rinne — where are those LTE smartphones you promised us? Remember, the ones with all the radios in them — to support multiple bands of LTE, as well as all the flavors of AT&T’s GSM network along with Wi-Fi and Bluetooth. Maybe we’ll see some by Christmas, when we can use them to keep warm for the short while that their batteries last? Seriously, though, it is heartening to see AT&T launching its LTE services with some grainy-edge coverage “maps” which are so small (and not available for zooming in or out) as to be not very useful in determining actual LTE coverage areas, other than to say, well, if you are in the middle of any one of the launch cities then you can probably expect coverage. But out at the fringes? Good luck finding any LTE bars. 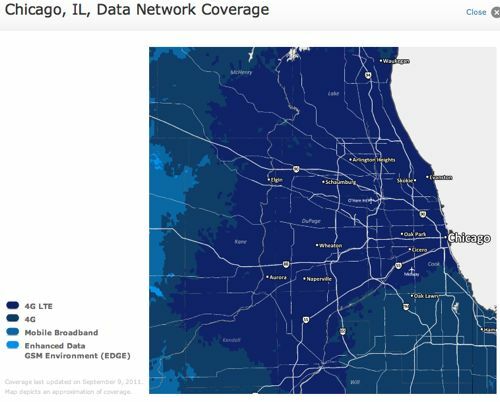 (Or if you live on the south side of Chicago, which apparently is not getting any LTE love from the map copied below.) And remember: It’s only hotspots and USB modems for AT&T LTE to start with, so no smartphones. Yet. 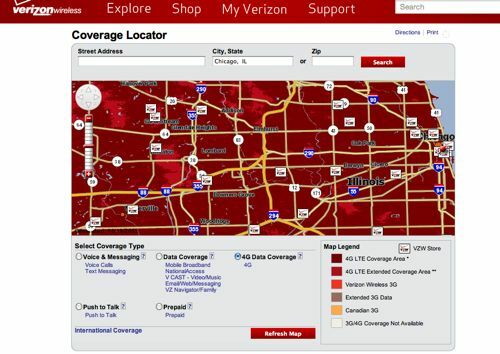 Of course, it’s not like AT&T competitor and 4G LTE trailblazer Verizon Wireless is perfect; a look at Verizon’s similar coverage map for Chicago shows a bit more granularity and the ability to zoom in and out (to help see those annoying non-covered patches of territory) but Verizon helpfully masks your data-gathering with big road maps and huge icons for Verizon Wireless stores. After all, that’s what you really wanted to find out, right? Kudos once again to Sprint and Clearwire for having much better clarity when it comes to coverage maps; you can go see for yourself, but Sprint has a system for letting you know if you can expect to have 4G coverage inside a building or not, while Clearwire still shows actual tower locations. How fast is AT&T 4G? 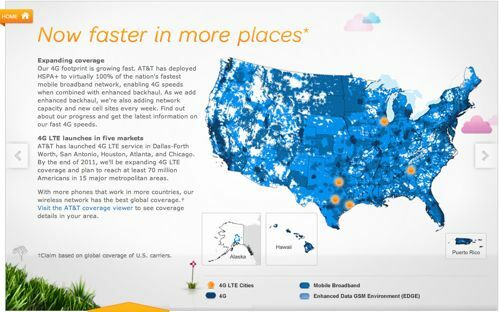 AT&T’s 4G strategy, including HSPA+ with enhanced backhaul and LTE, delivers super fast broadband speeds. 4G HSPA+ with enhanced backhaul delivers speeds up to 4X faster than AT&T’s already fast mobile broadband network. And as it is deployed, 4G LTE will deliver even faster speeds than 4G HSPA+. The combination of the two technologies provides the best option for your wireless work or entertainment. Note: Limited 4G LTE availability in select markets. 4G speeds delivered by LTE, or HSPA+ with enhanced backhaul, where available. Deployment ongoing. Compatible device and data plan required. LTE is a trademark of ETSI. Learn more at AT&T 4G. So… buyer beware, I guess. Or… let our merger happen, and it will all get better! Right! Sprint HTC EVO View 4G, at CTIA. Credit: Sidecut Reports. 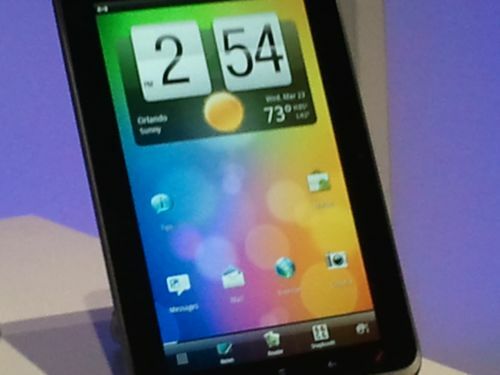 Sprint jumped into the unofficial 4G tablet market lead Monday by announcing a June 24 availability date for the HTC EVO View 4G, the slick device that Sprint and HTC announced back in March at CTIA. While the form factor of the device doesn’t break new ground the data plans do, especially the fact that Sprint’s truly unlimited amount of 4G data downloads means that heavy data users — those who use their tablets to watch a lot of video, for instance — may want to gravitate toward Sprint’s offerings instead of those from other vendors, who impose strict caps or data-speed slowdowns. While Sprint’s new data plan structure for tablets and pads is sure to cause some customer confusion (there are several different rates for different amounts of monthly data available via the device’s 3G connection), there is no confusion around Sprint’s 4G data usage metering — under all circumstances users still get real unlimited data use on the Clearwire WiMAX network that Sprint uses for 4G services. The new HTC tablet itself, with a 7-inch touchscreen, is priced at $399.99. 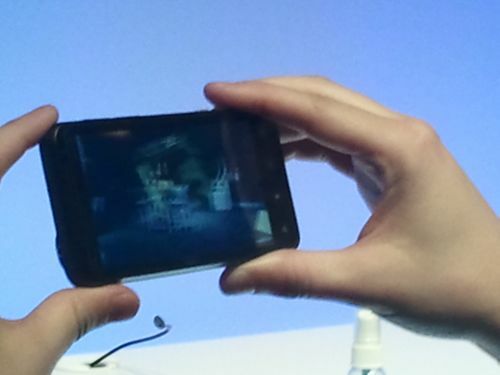 Sprint also announced today the June 24 availability of the HTC EVO 3D, a phone that has to be seen to be believed for its ability to show 3D images without the silly glasses. Is it something you really need? If so for $199.99 and the standard contracts it can be yours later this month. Sprint EVO 3D, shown at CTIA. Credit: Sidecut Reports. You are currently browsing the archives for the CTIA category.